Blackburn Athletic H 2 3 ? Cormack O'Rourke, Lambert, R. Pryde, Henderson, D. Murray, Carruthers, R. Murray, Hay, McLean, Cormack. Fauldhouse United H 4 0 ? Linlithgow Rose H 4 3 ? Portobello Thistle H 1 0 ? Tranent Juniors H 1 8 ? A 4 2 Hay 3, ? On the 1st of February 1934, Portobello Thistle lodged a protest with regard to a match in the previous season with Newtongrange Star on 12th April 1933. It was alleged that George Herbert had taken part in a match between Dalkeith Thistle A and Arniston Rangers A. The East of Scotland Association upheld the protest. Newtongrange Star appealed to the Scottish Junior Football Association who sent the case back to the East of Scotland Association who rescinded their decision. George Herbert then admitted that he did play in the game and the protest upheld once again. 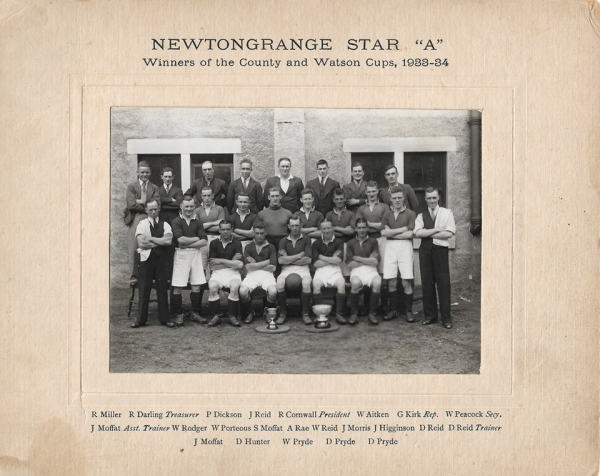 Newtongrange Star were thus stripped of the League Championship for the 1932/33 season. A further appeal was made to the Scottish Junior Football Association and on 1st March 1934 they upheld Newtongrange Star's appeal and the League Championship was reinstated. Following this on 8th March 1934 a public meeting was held at Lothian Halls, Newtongrange to discuss the financial position of the club. A motion was tabled and a vote taken that found the Newtongrange public had no confidence in the present management who subsequently resigned. A new management was elected on 12th April 1934. 1 A Bonnyrigg Rose 2 2 Hay 2 O'Rourke, Lambert, Ramage, Marr, Henderson, R. Pryde, Carruthers, Murray, Hay, Thomson, A. Pryde. H Dunbar United 1 1 ? A Portobello Thistle 4 5 ? 1 A Dunbar United 1 0 ? 2 H Linlithgow Rose 2 2 ? A Linlithgow Rose 2 3 ? 1 H Blackburn Athletic 4 1 ?